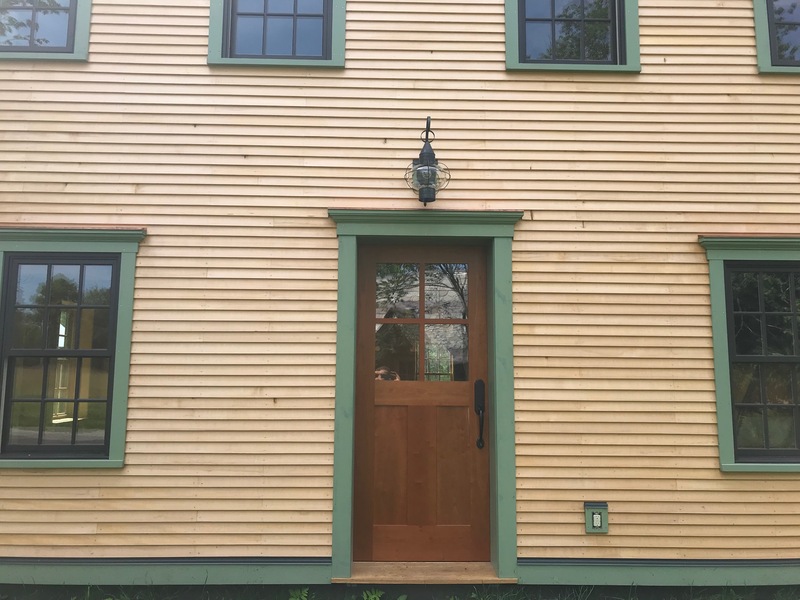 I designed and built a home for my wife and myself near my shop in Lincoln. 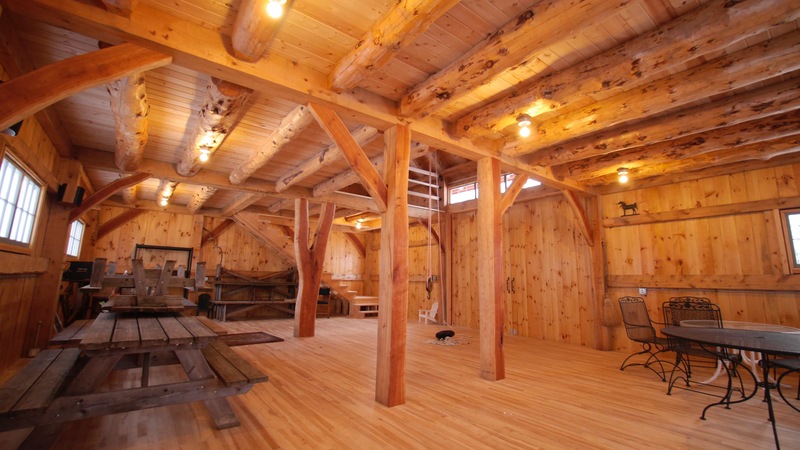 It’s a hybrid design, featuring a double-stud exterior wall of local, rough-sawn pine with interior structure framed with timber. 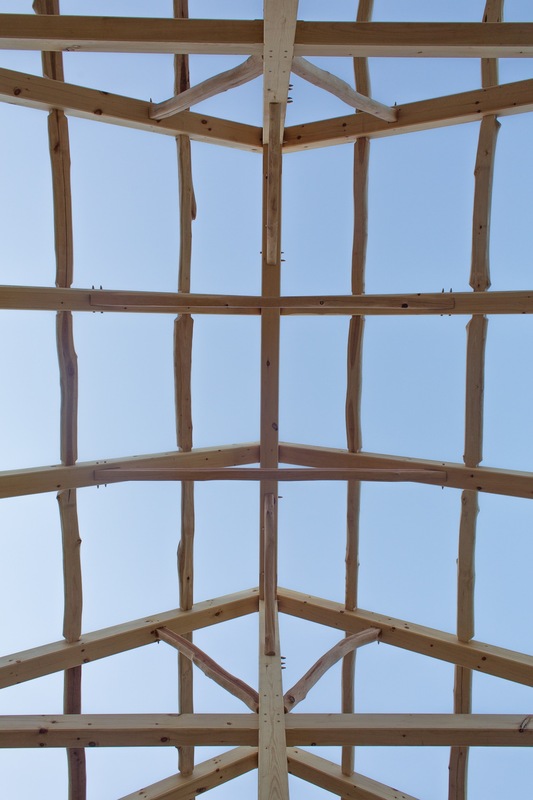 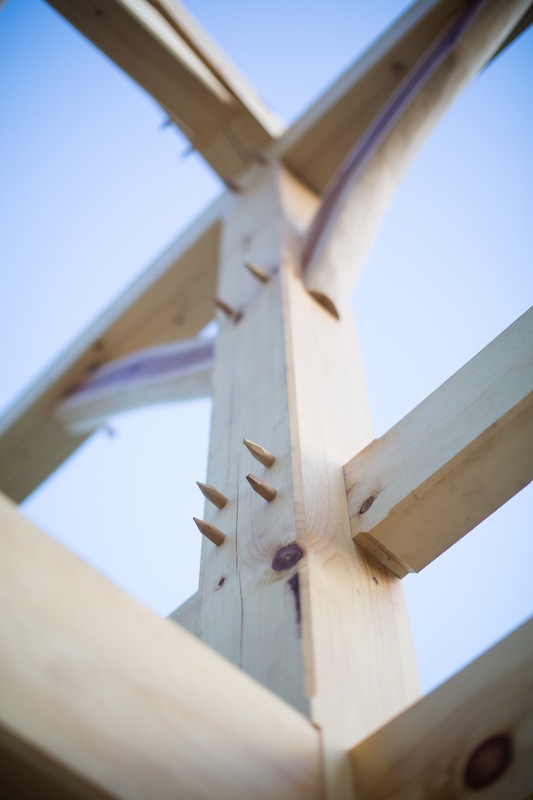 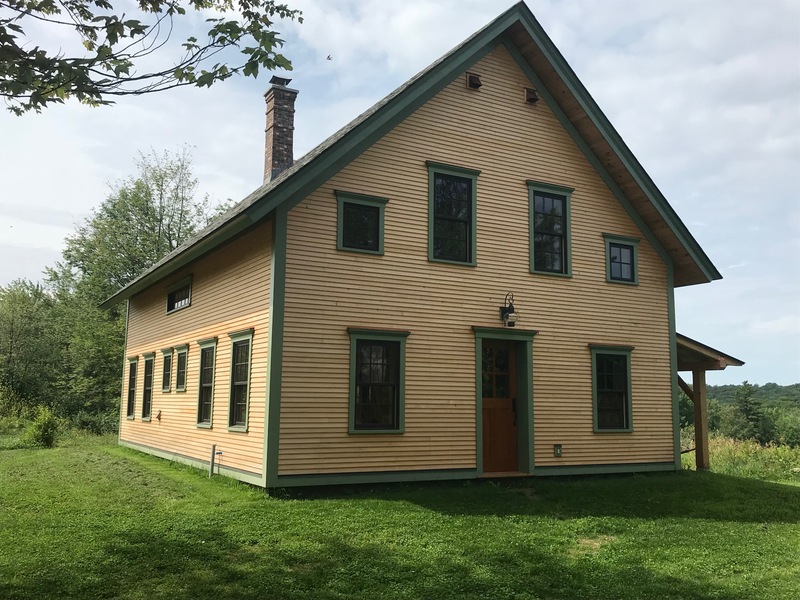 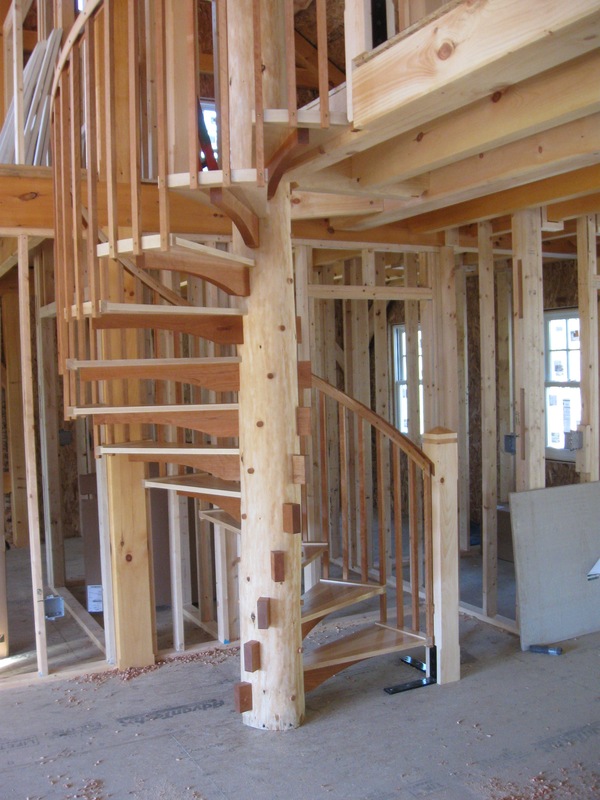 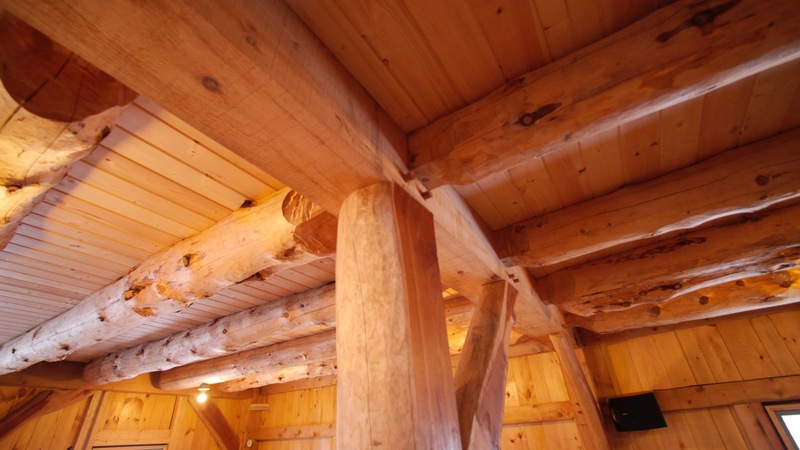 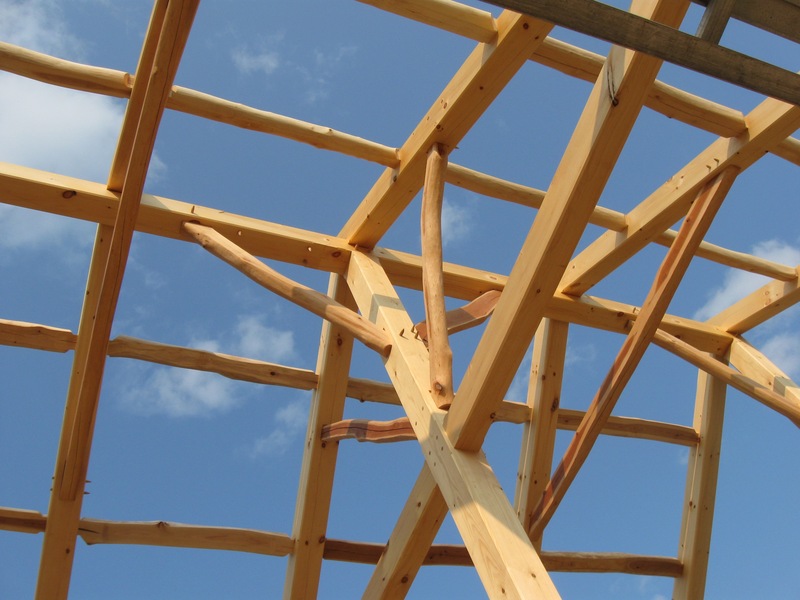 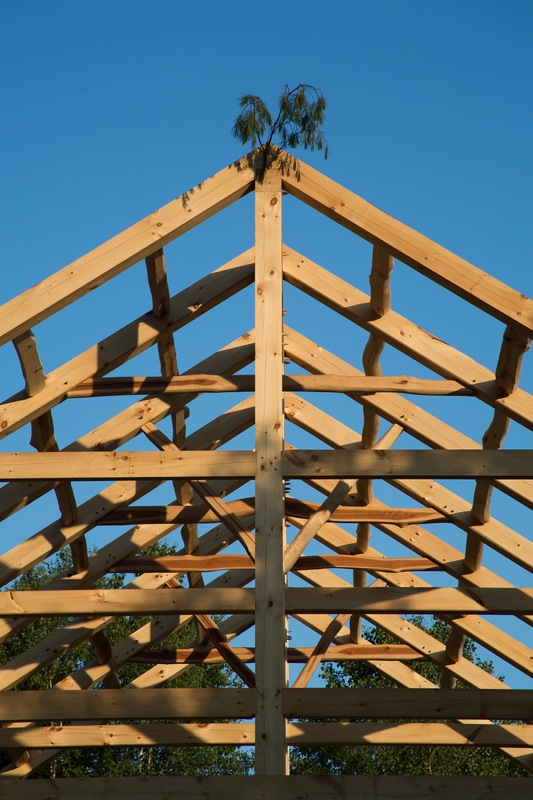 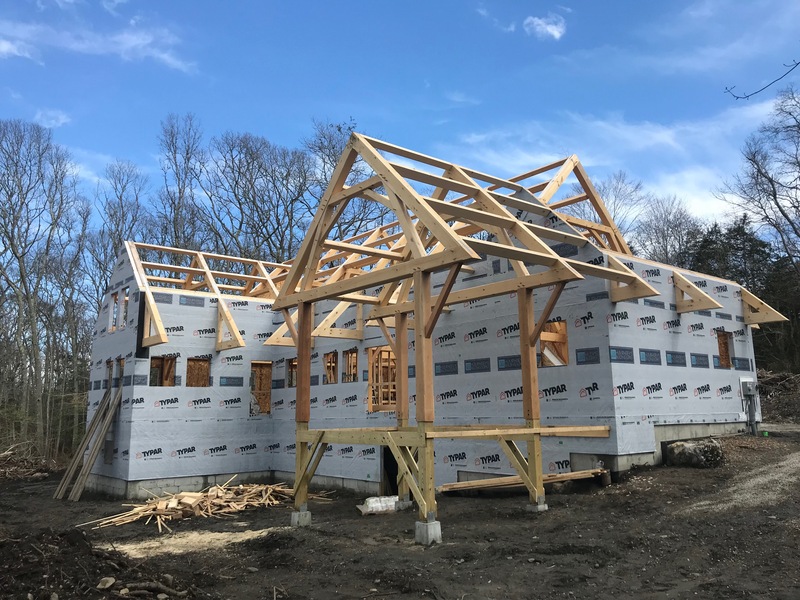 This hybrid style can make a lot of sense for new house construction, combining the beauty and strength of timber framing with the efficiency of a locally-sourced double-stud envelope. 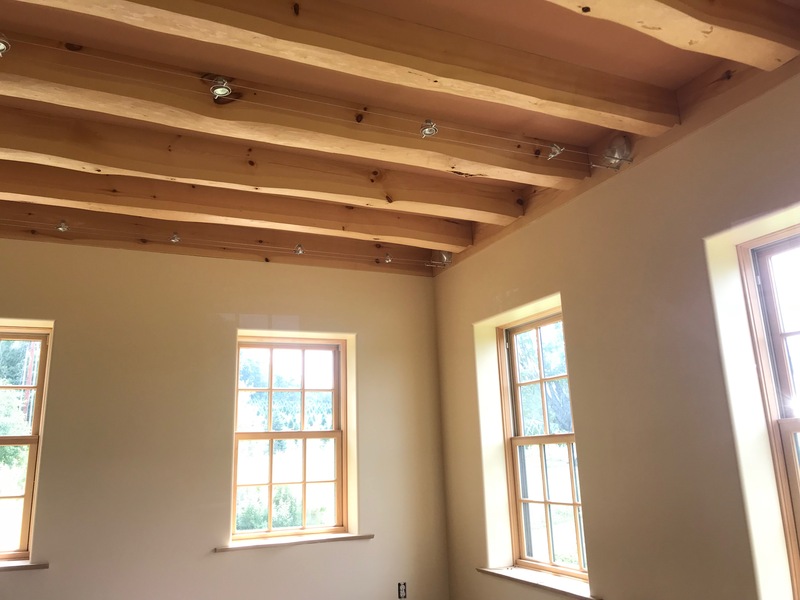 Although I usually limit my scope of work to just the timber frame, in this case I did almost everything from concrete to slate roof to brick masonry and frame-to-finish carpentry. 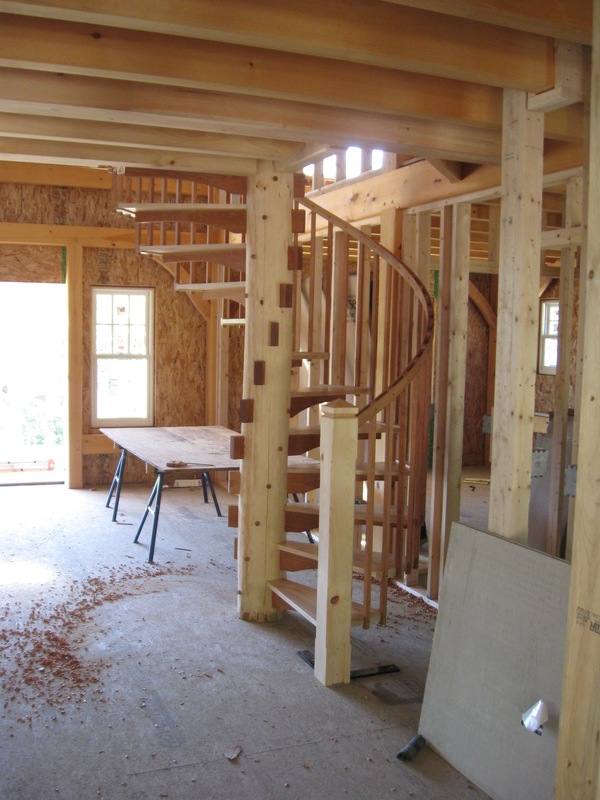 It’s been a rewarding process and I may consider some whole-house projects in the future. 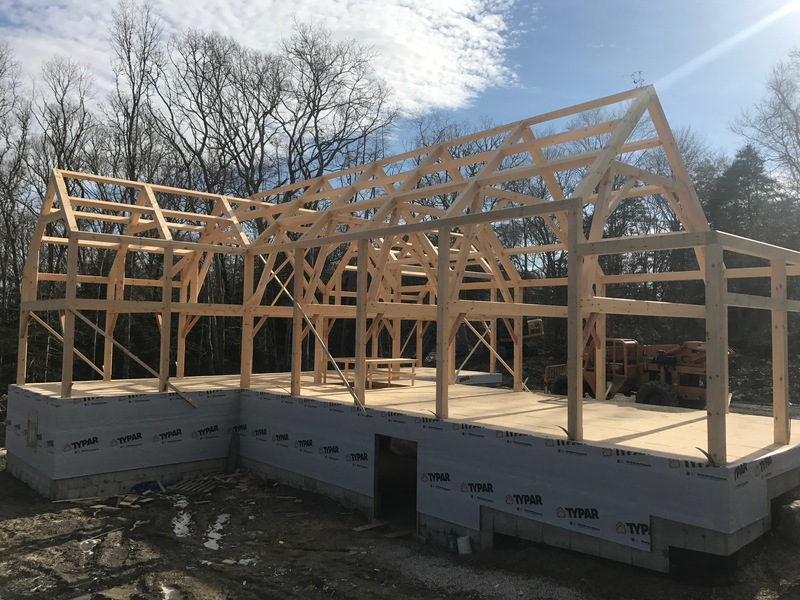 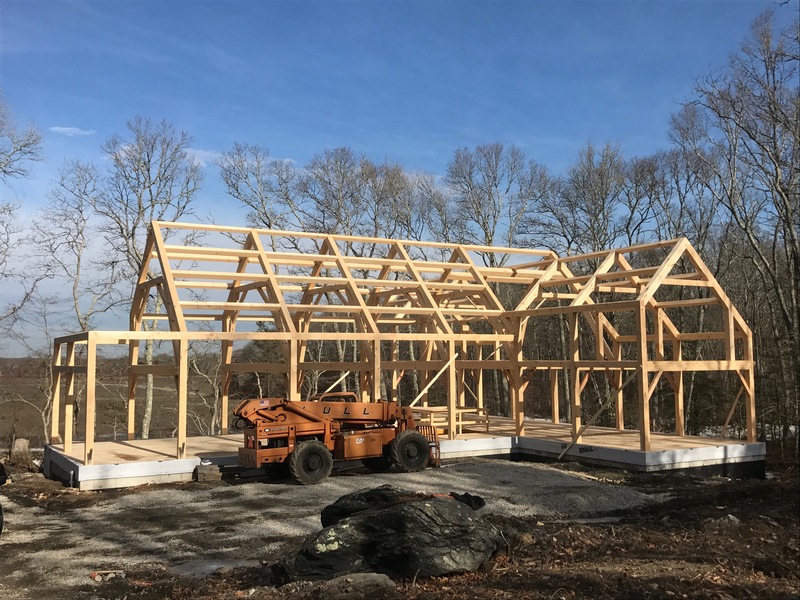 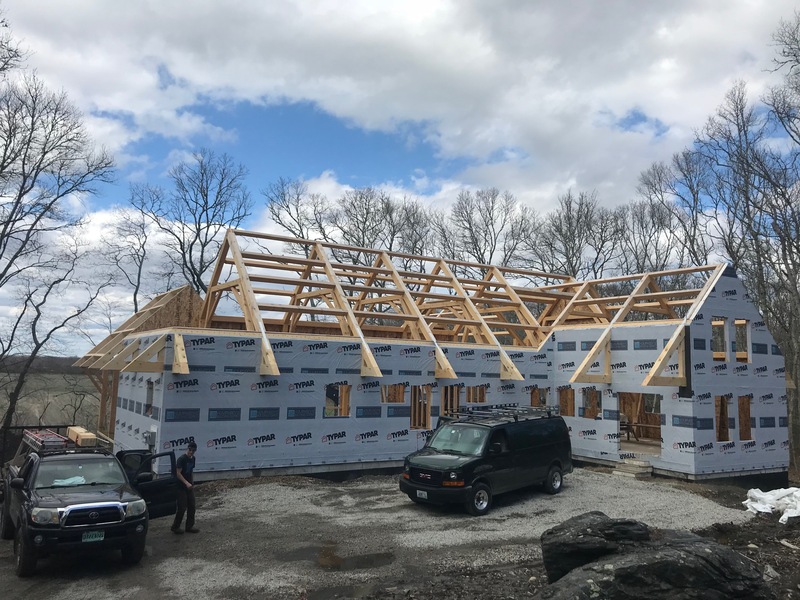 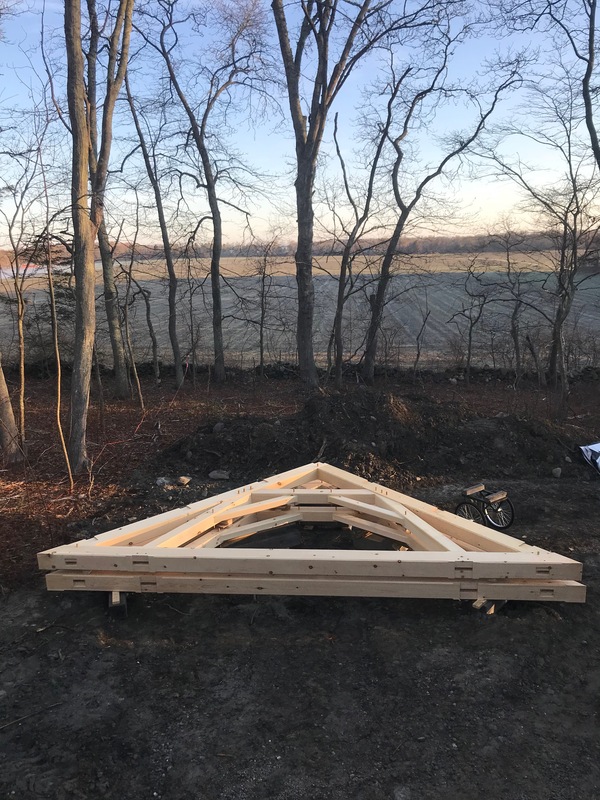 The winter of 2018 found us fabricating and raising a large and complex frame for a house in lovely Little Compton, RI. 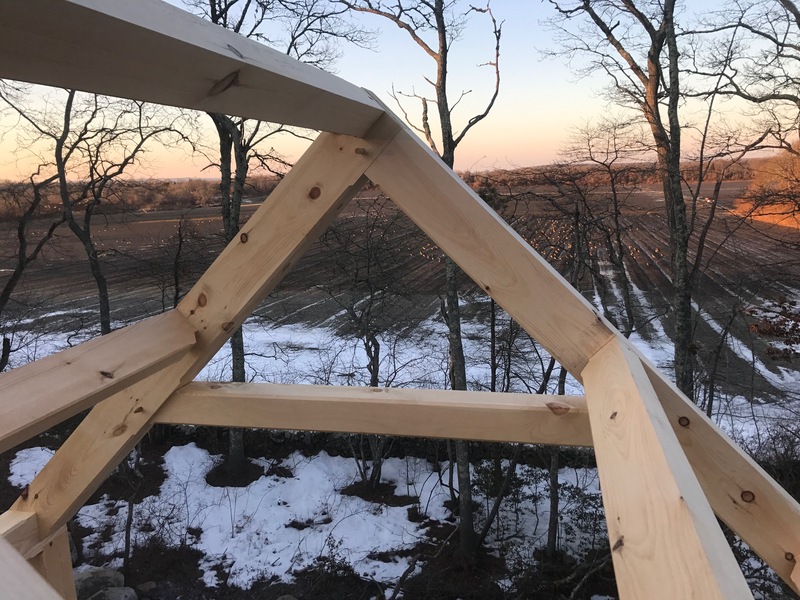 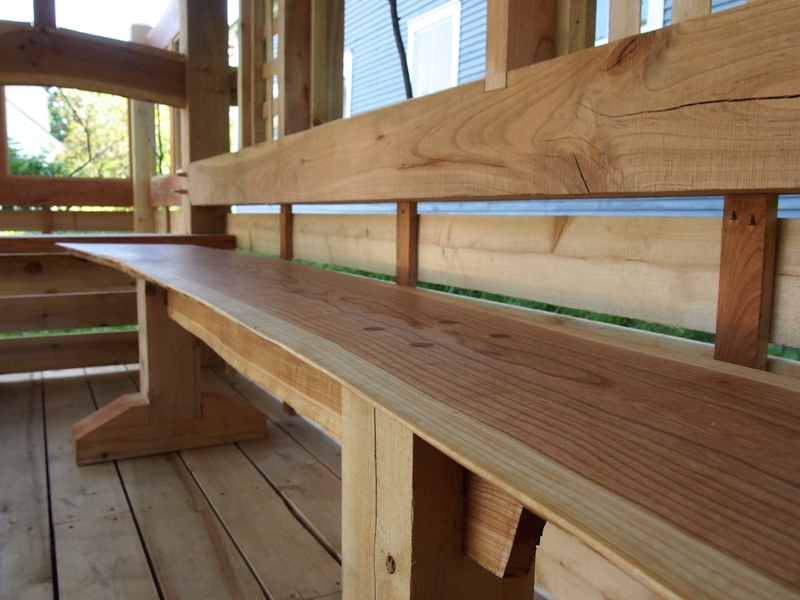 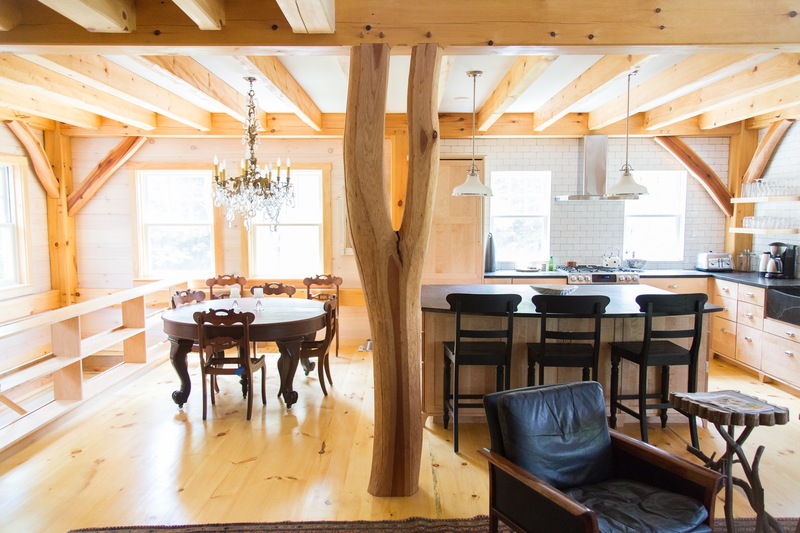 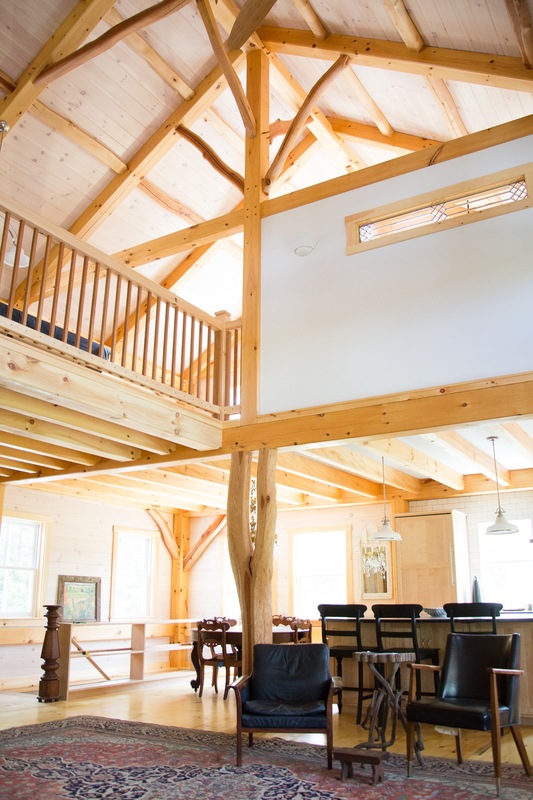 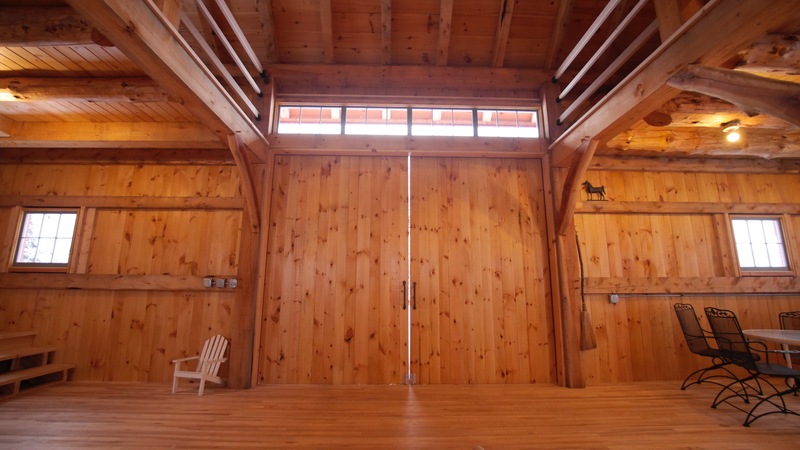 The frame had over 20,000 board feet of timber (VT white pine, with braces sawn from black oak from the house site in RI), the largest we’ve done. 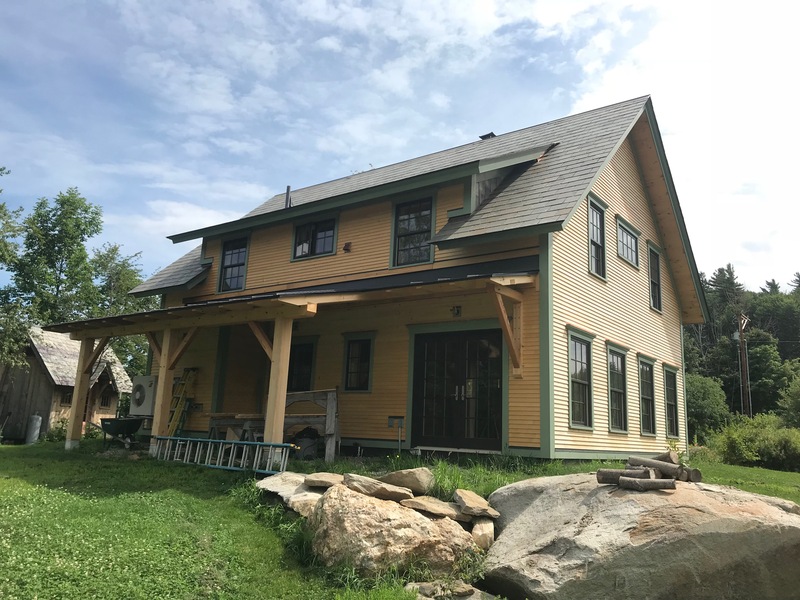 The architect’s design called for an unusual arrangement with asymmetrical wall heights, enormous eave overhangs, and many competing rooflines. 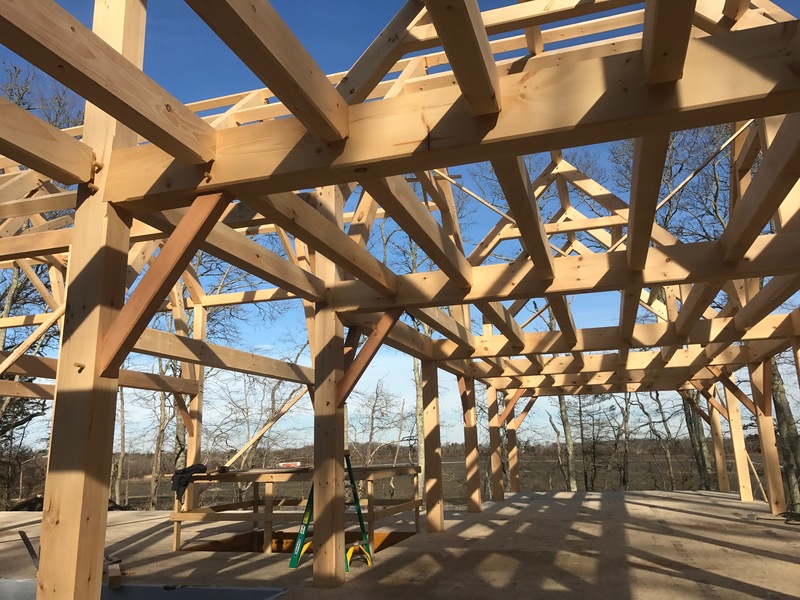 We worked to design a frame that could safely and efficiently realize the conceptual plan, utilizing a kind of modified liegender stuhl form borrowed from the Germanic timber framing tradition. 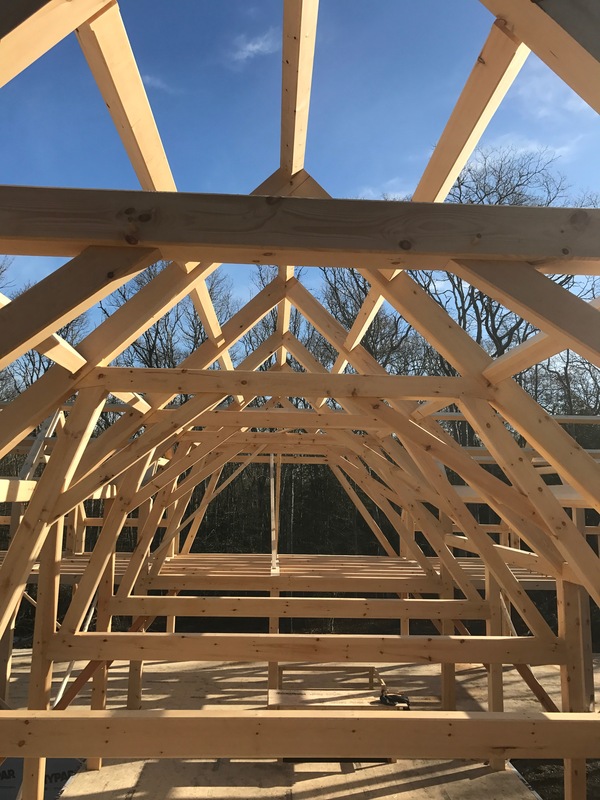 Unfortunately the frame proved devilishly difficult to photograph; it was raised in stages, with the site carpenters installing wall panels before the timber porch and overhangs were added. 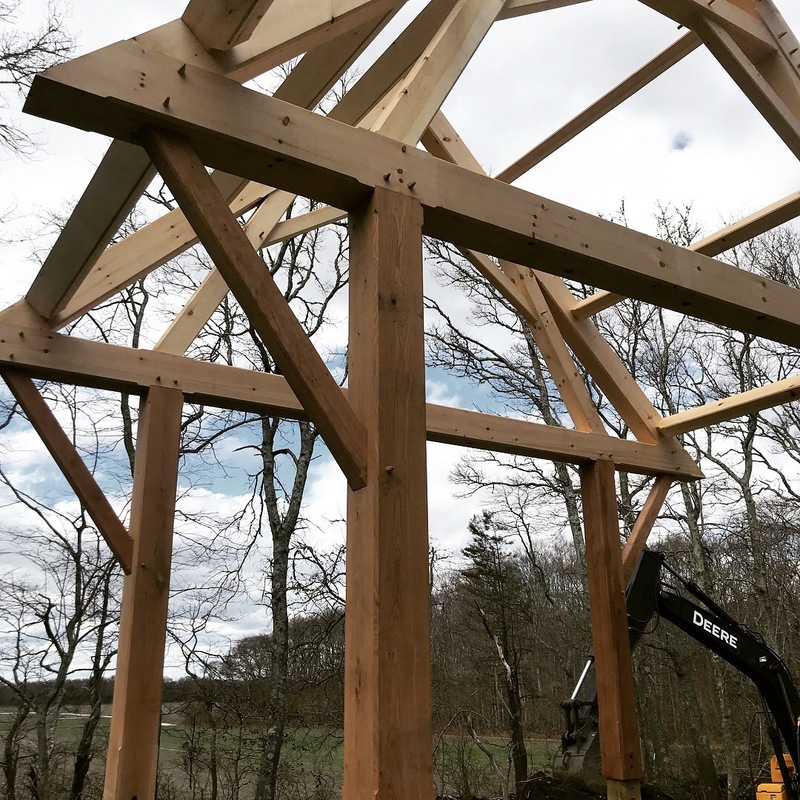 Hopefully these photos give a sense of the scale and complexity of the frame. 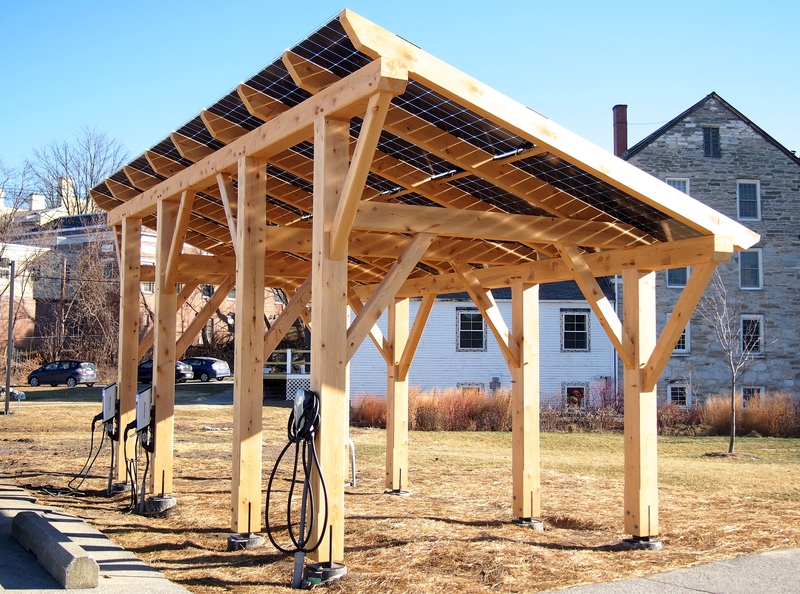 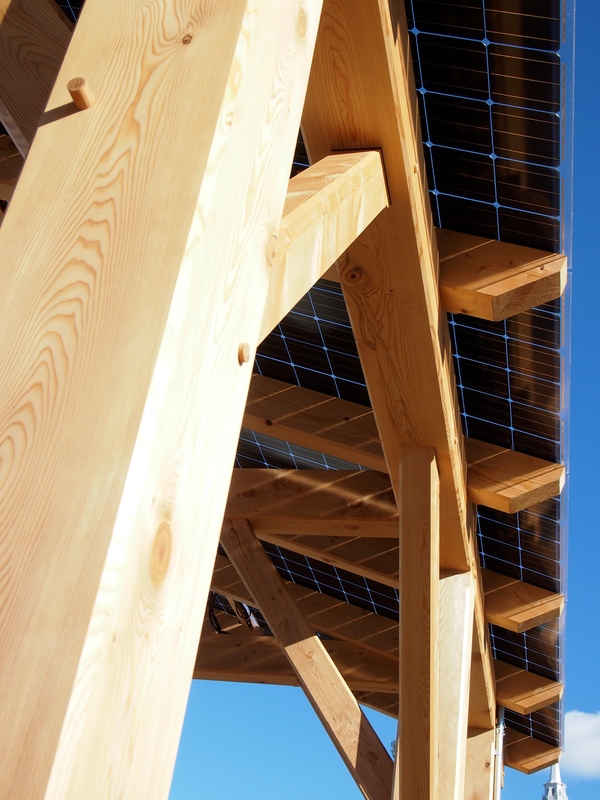 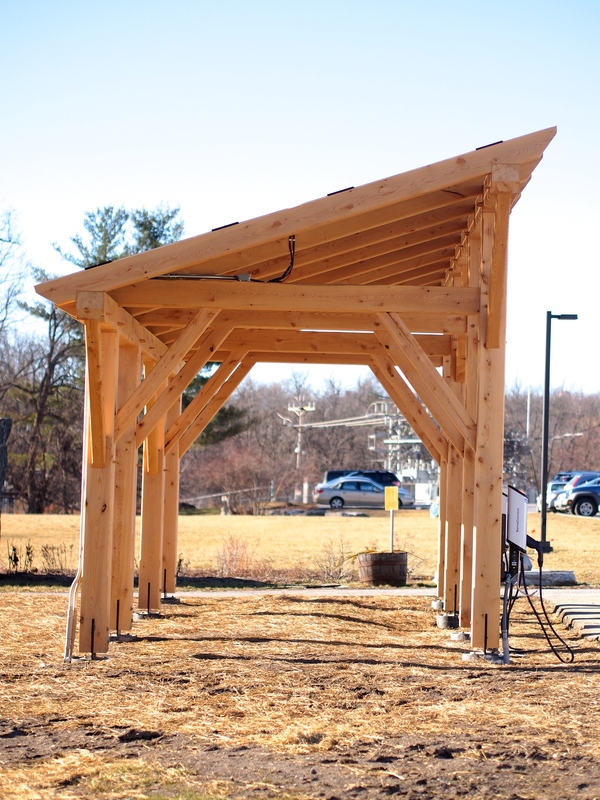 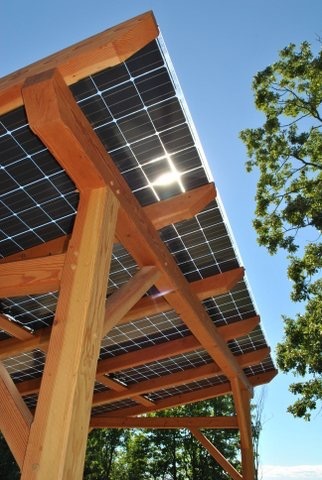 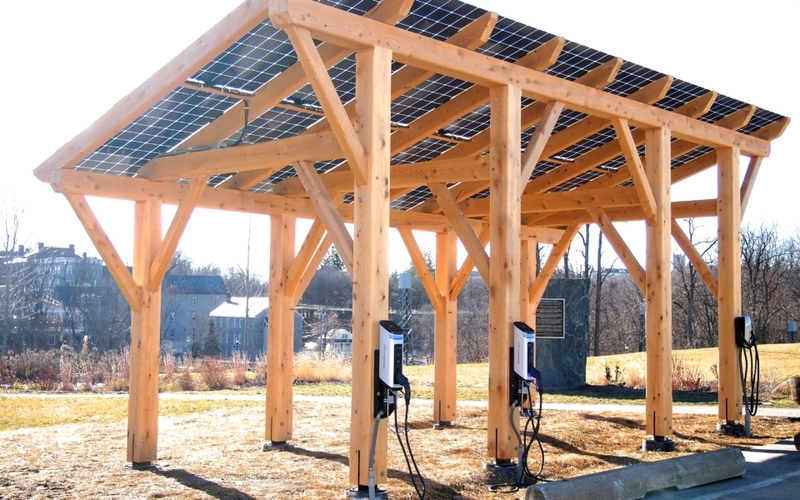 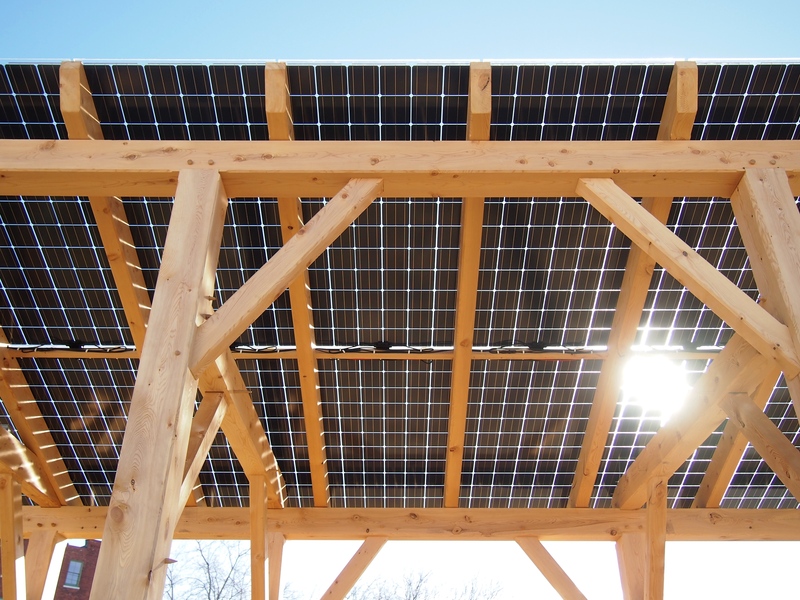 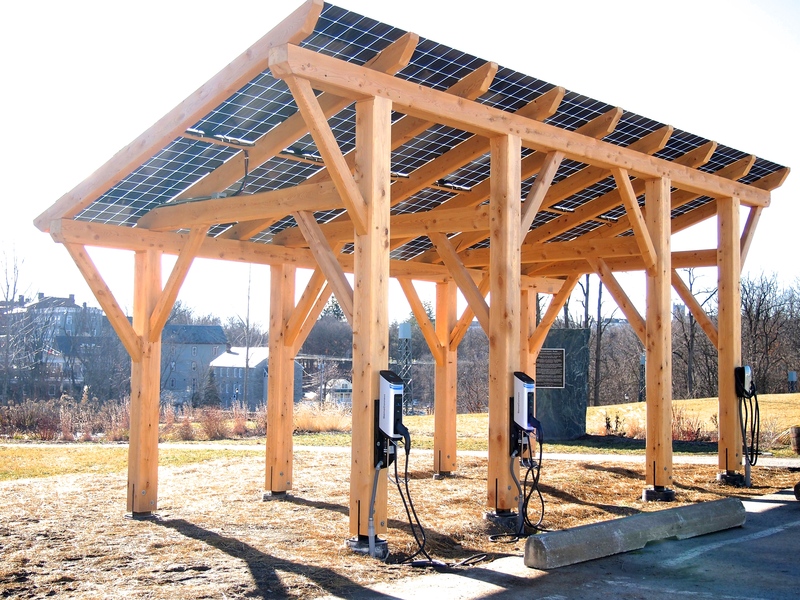 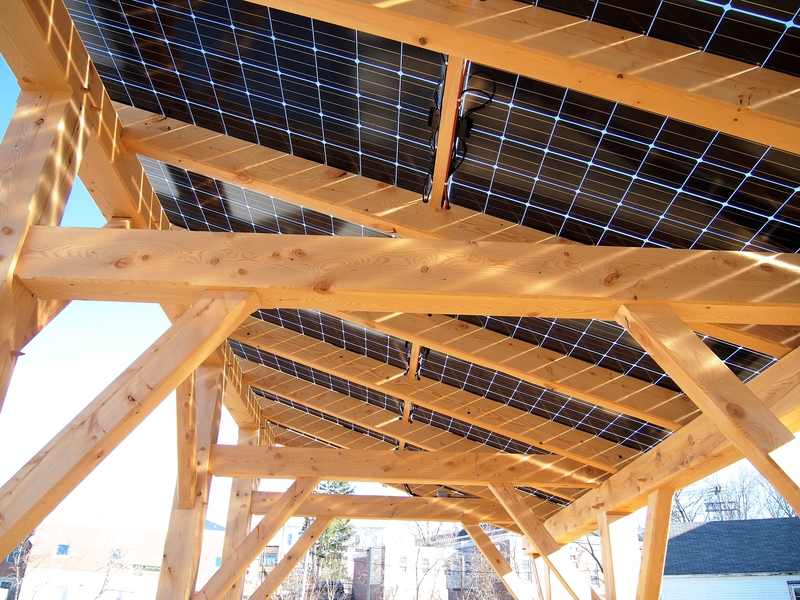 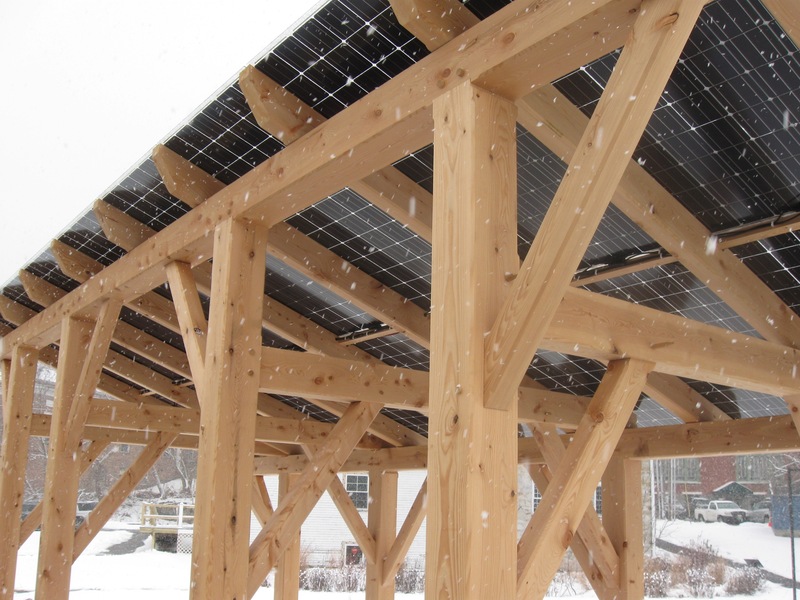 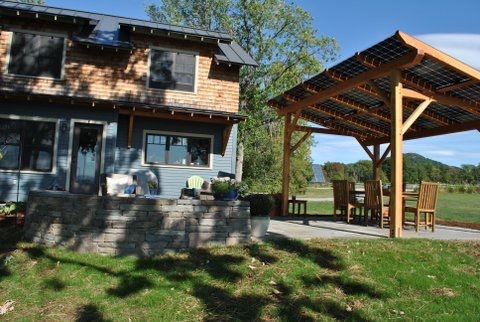 We’ve created a few timber framed solar-panel stands in collaboration with Smith and McClain, Inc., a solar contractor in Bristol, VT. One of these serves as an electric vehicle charging station in the Marbleworks center in downtown Middlebury, VT. Pairing small-scale solar power generation with locally-grown and crafted timber frames is a no-brainer! 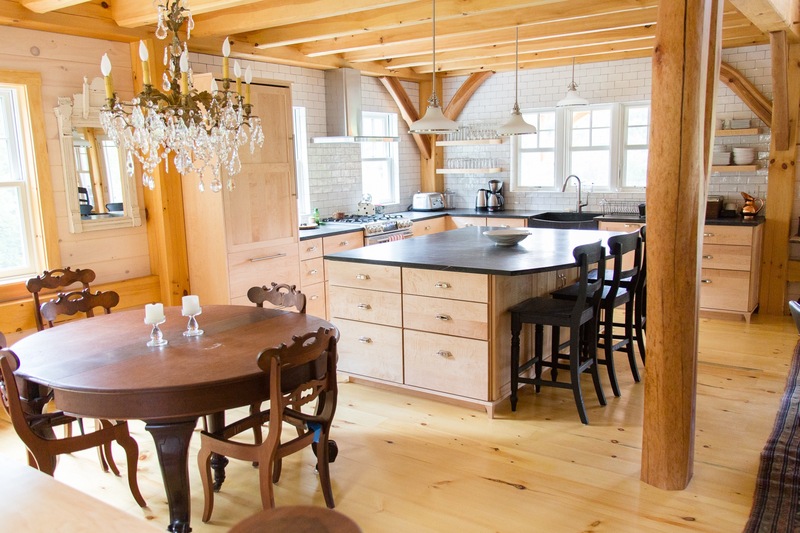 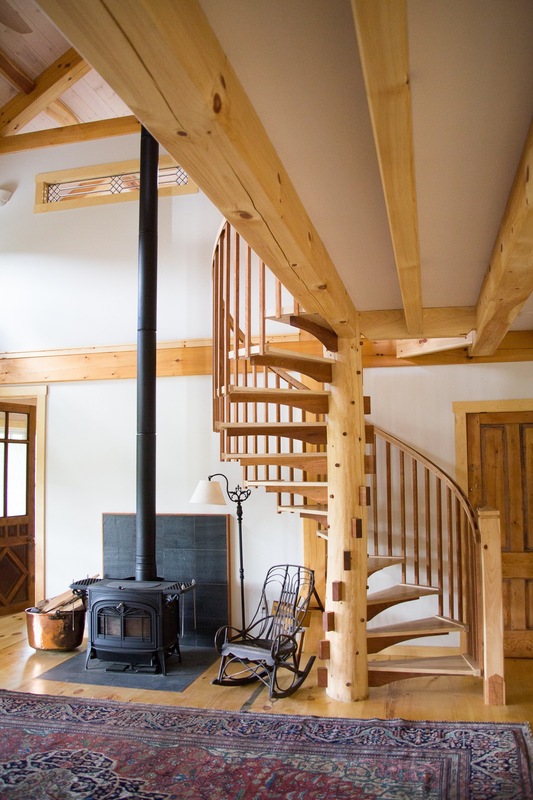 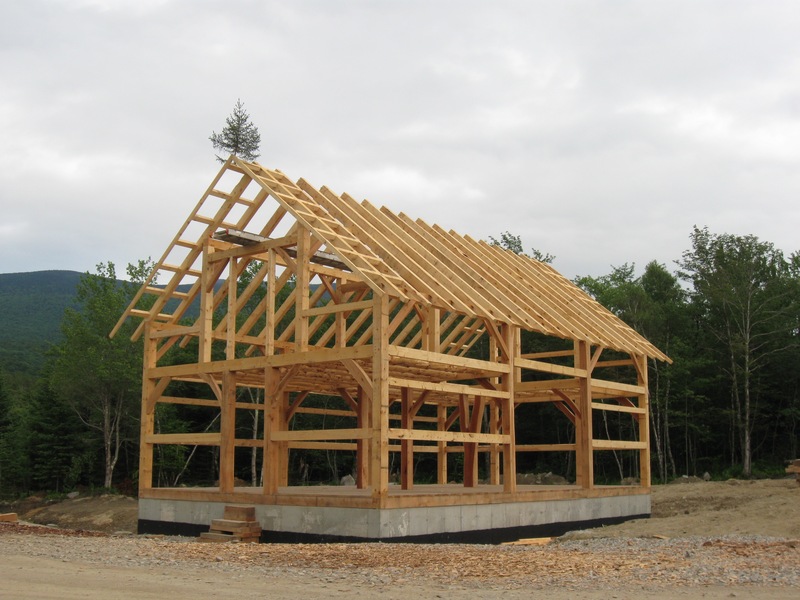 We designed, cut and raised a timber frame home for clients on a gorgeous 300-acre farm in Bethel, VT. All of the timber for the frame was logged from their land with draft horses and sawn on site. 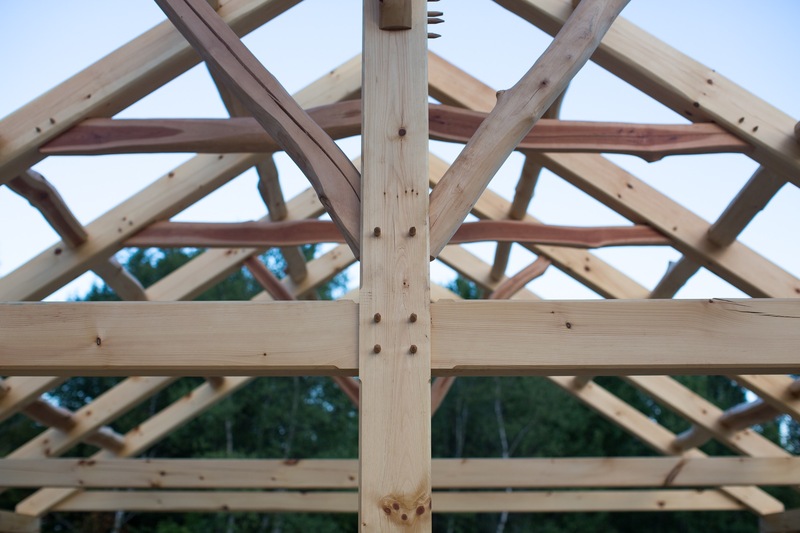 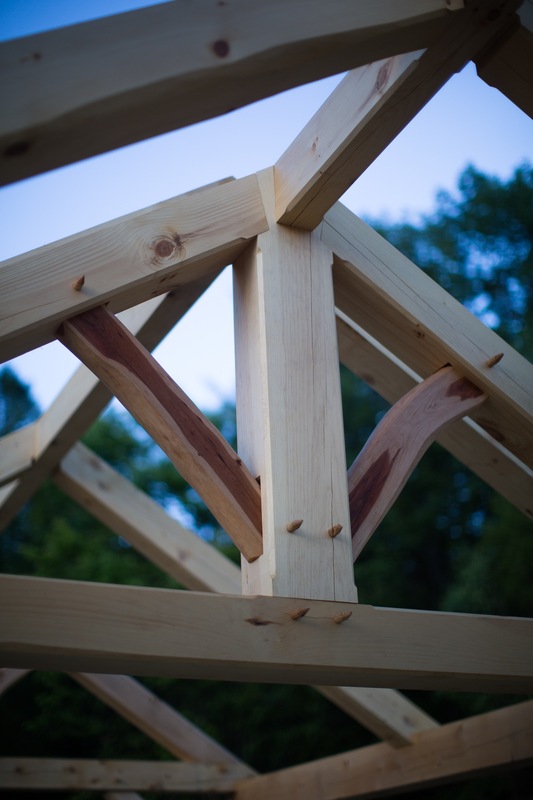 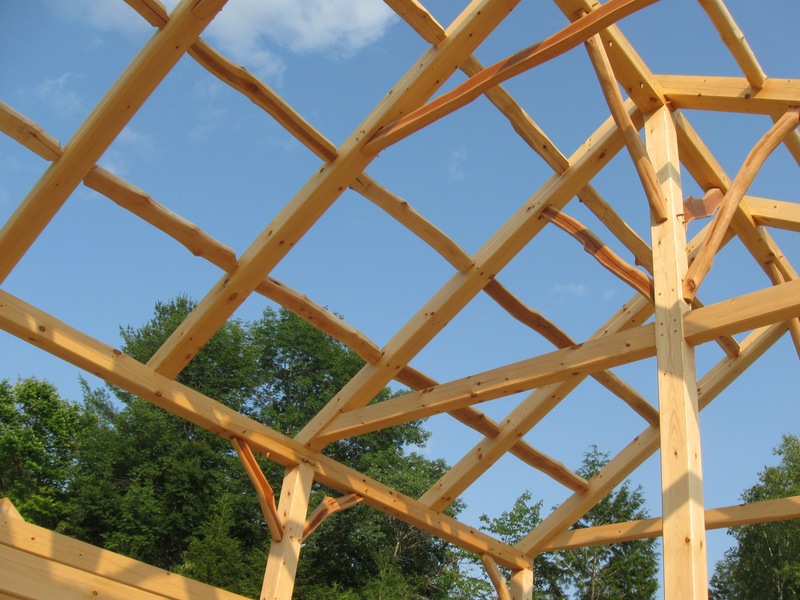 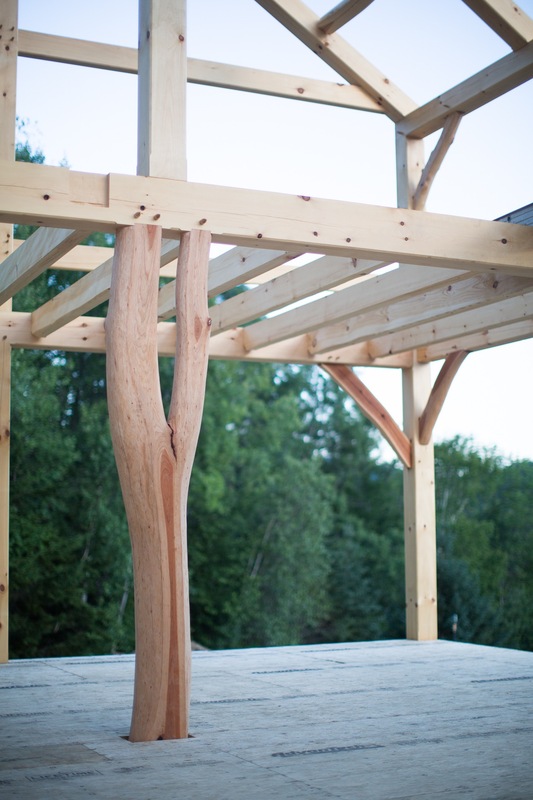 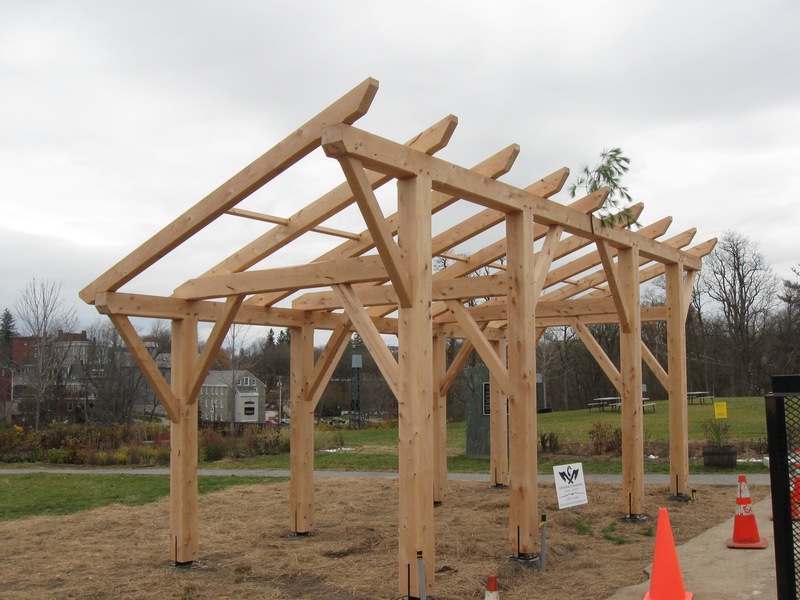 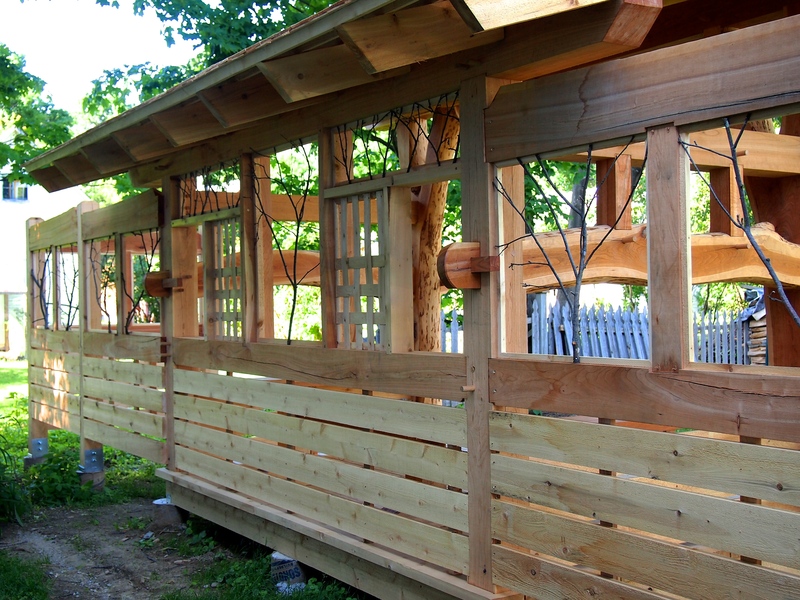 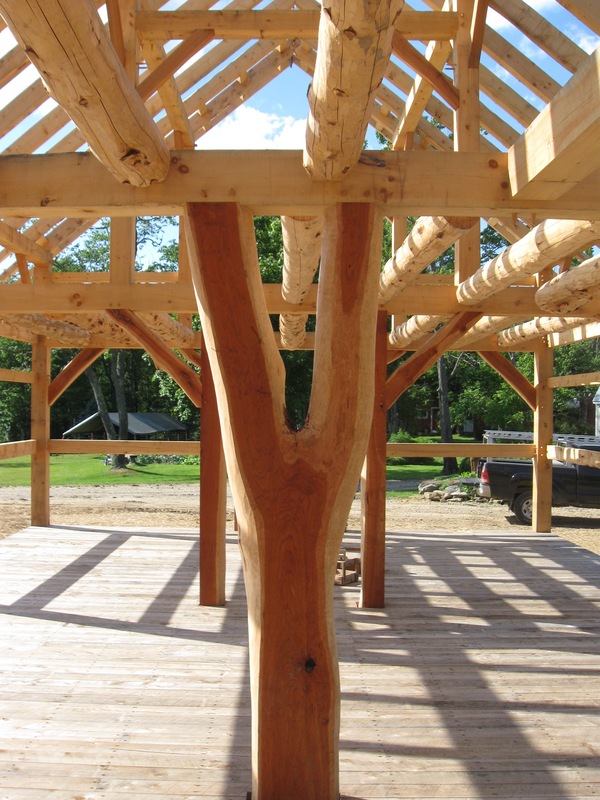 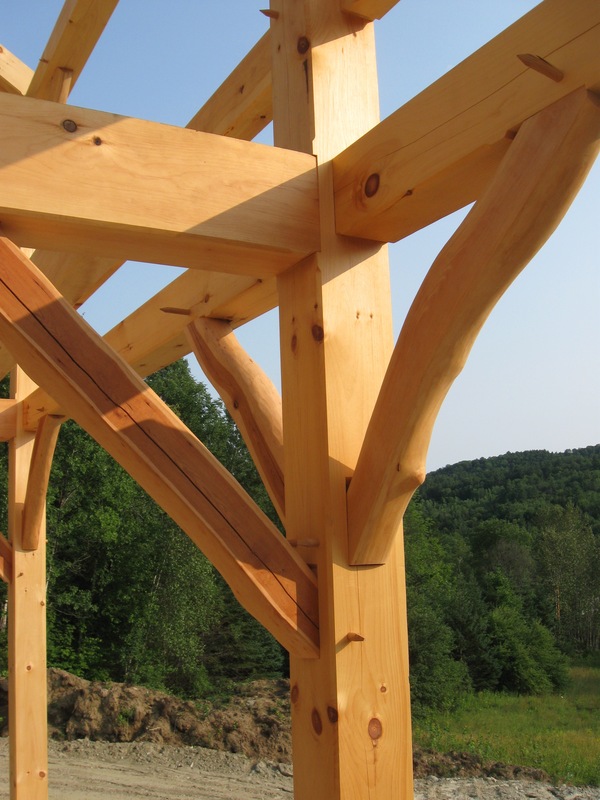 The frame is a mix of hemlock, spruce and pine, with naturally-curved braces, struts, and purlins of mixed hardwood species. 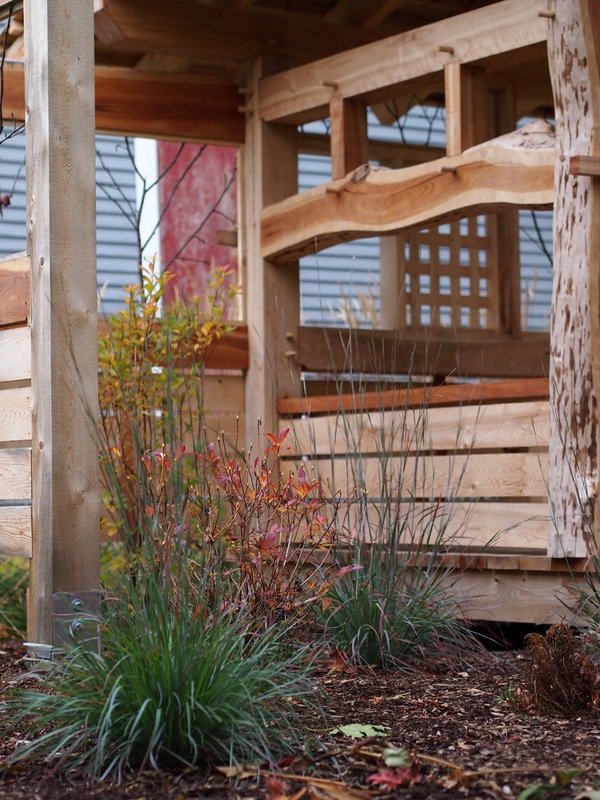 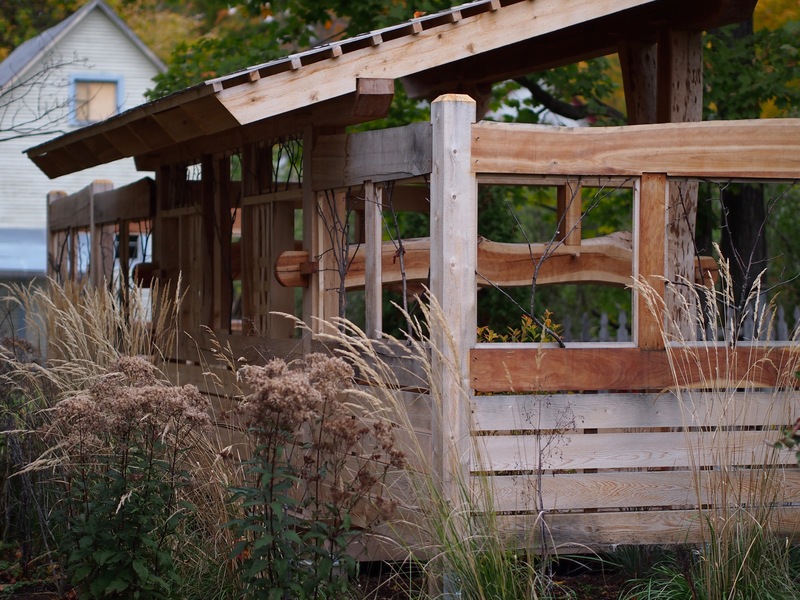 In the spring of 2015, we had the pleasure of working with Studio Roji to design a garden shelter inspired by the Japanese machiai style. 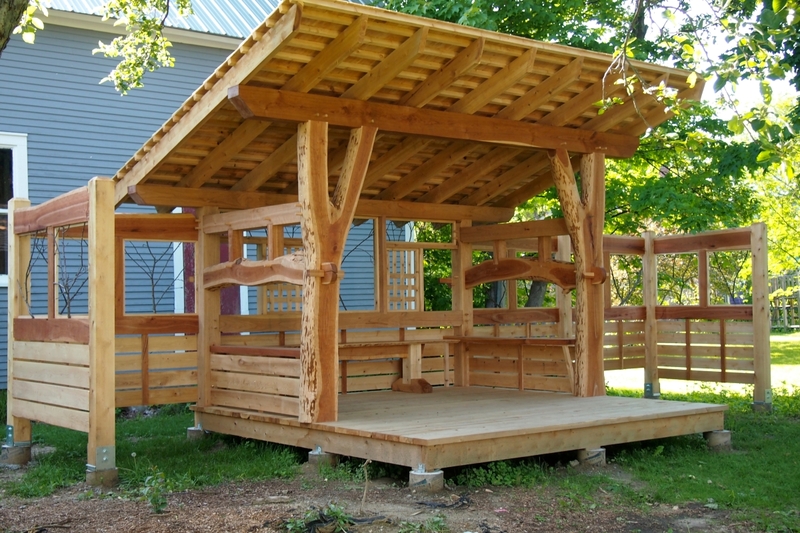 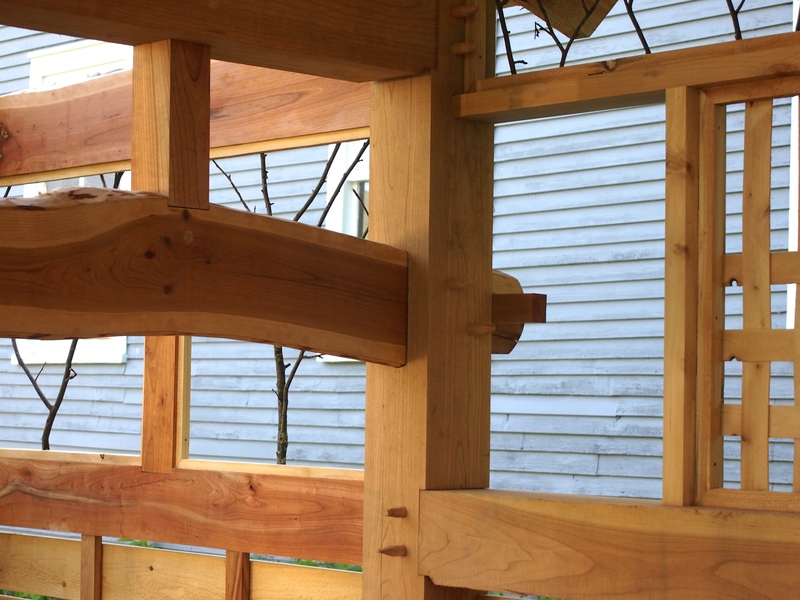 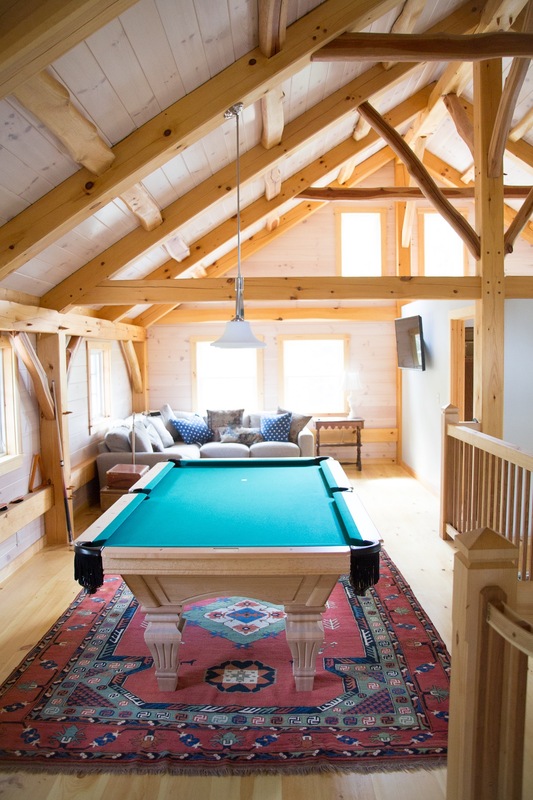 The resulting frame, made of local eastern white cedar and black cherry, blends elements of traditional Japanese design with a traditional Vermont timber frame sensibility. 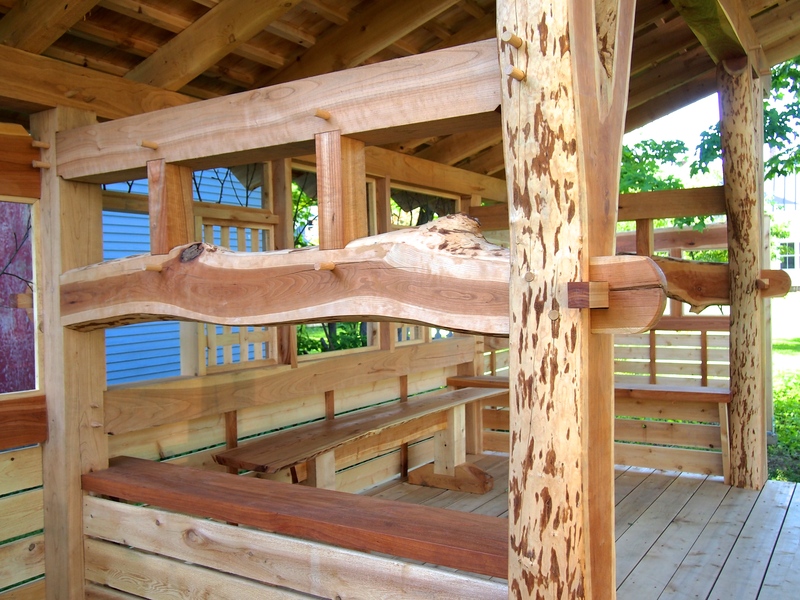 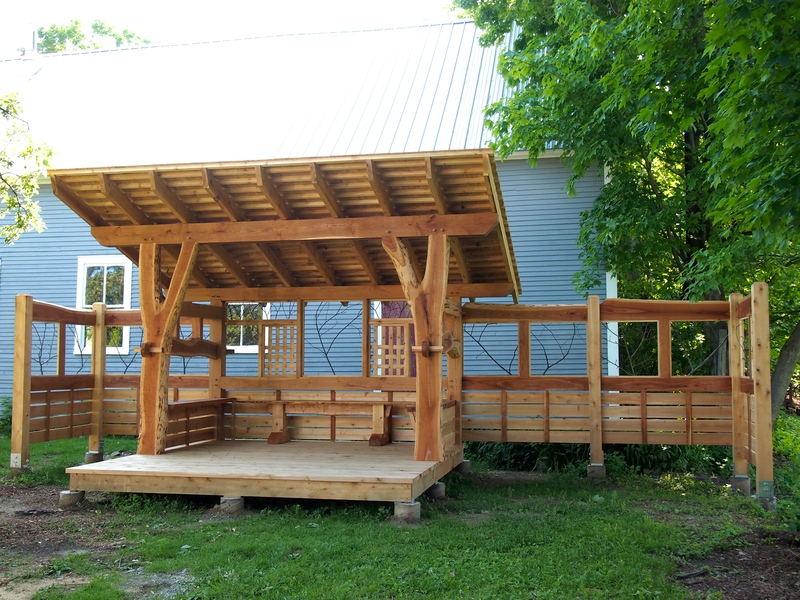 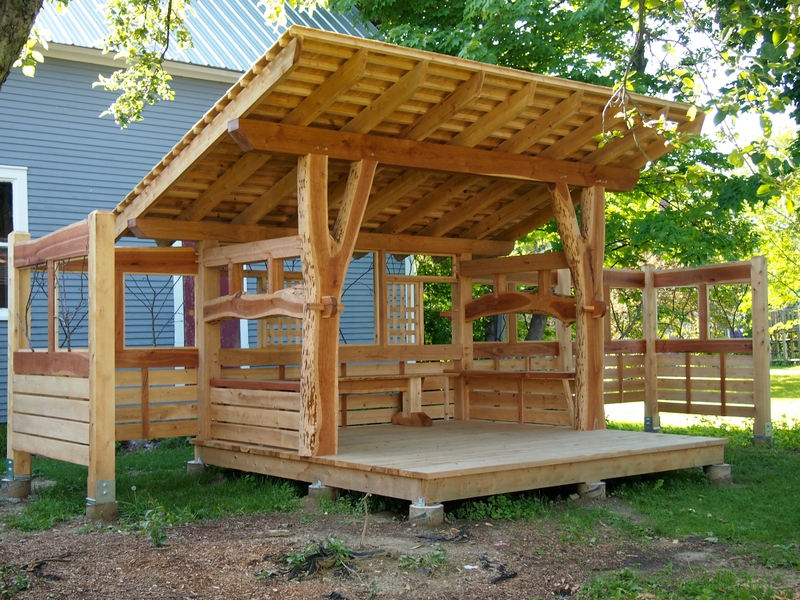 Goosewing Timberworks did all of the carpentry, including the local white cedar deck and roof. 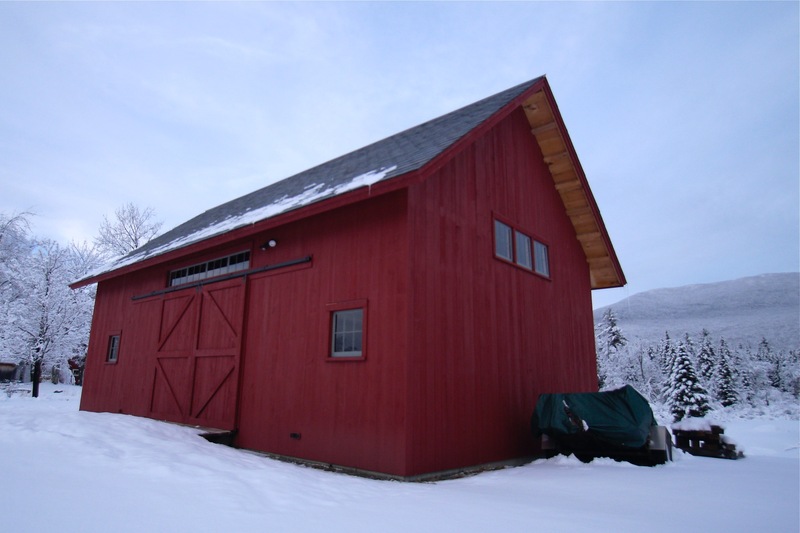 English Barn in Lincoln, VT. 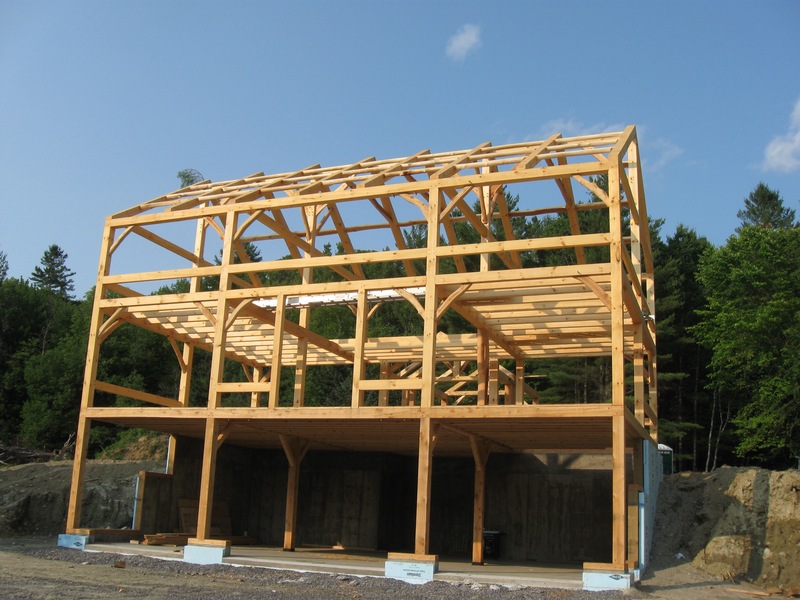 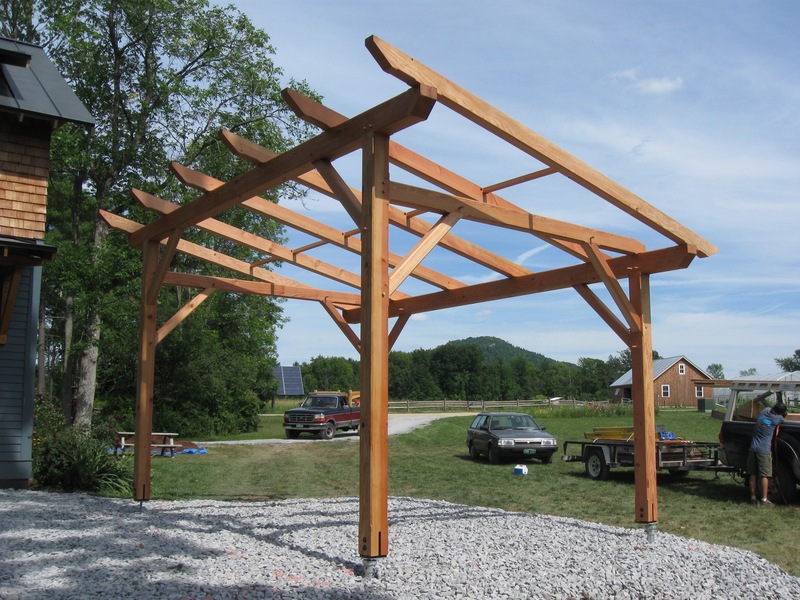 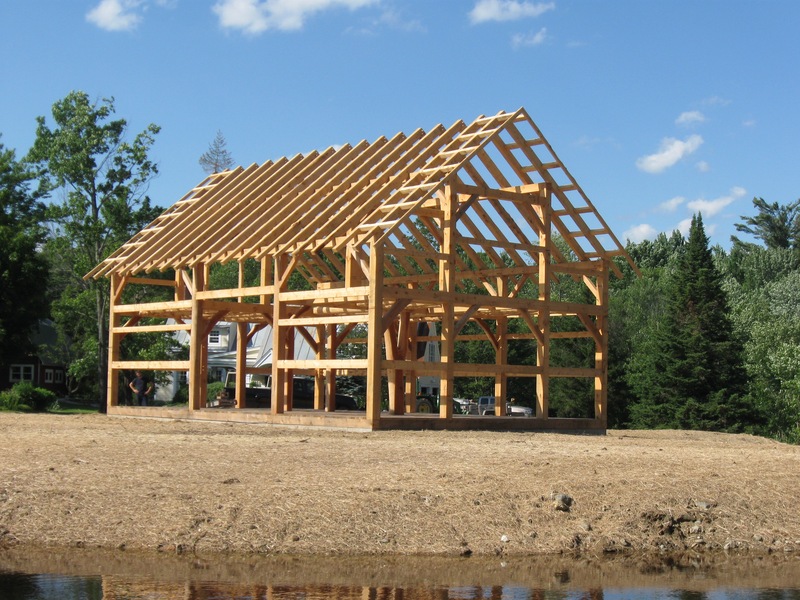 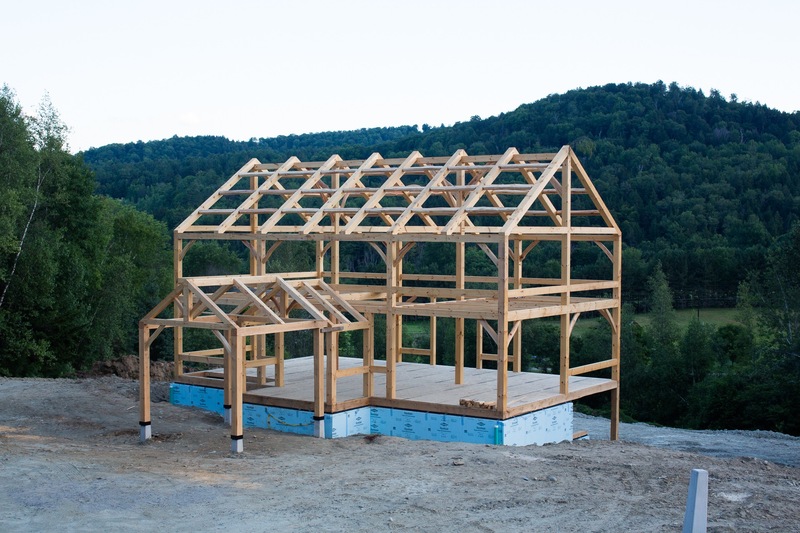 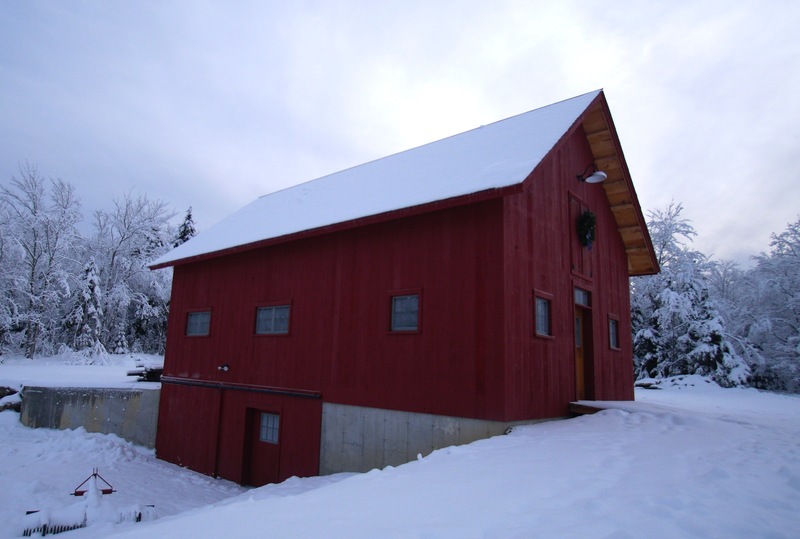 In the summer of 2014 we cut and raised the timber frame for a barn for some friends of ours in Lincoln, VT. 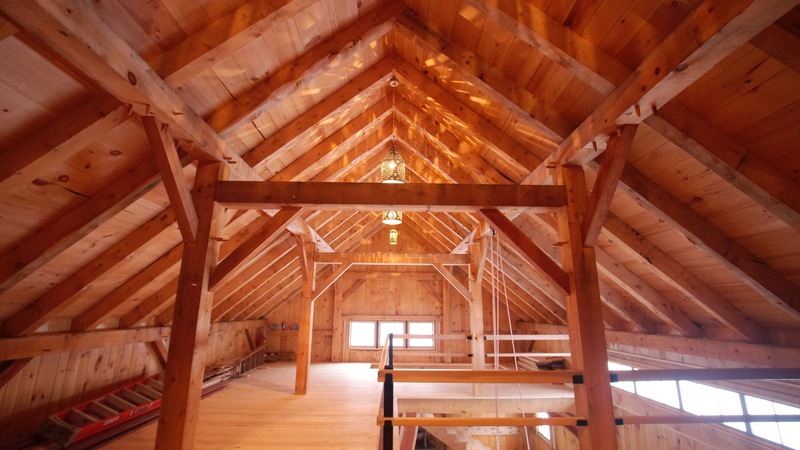 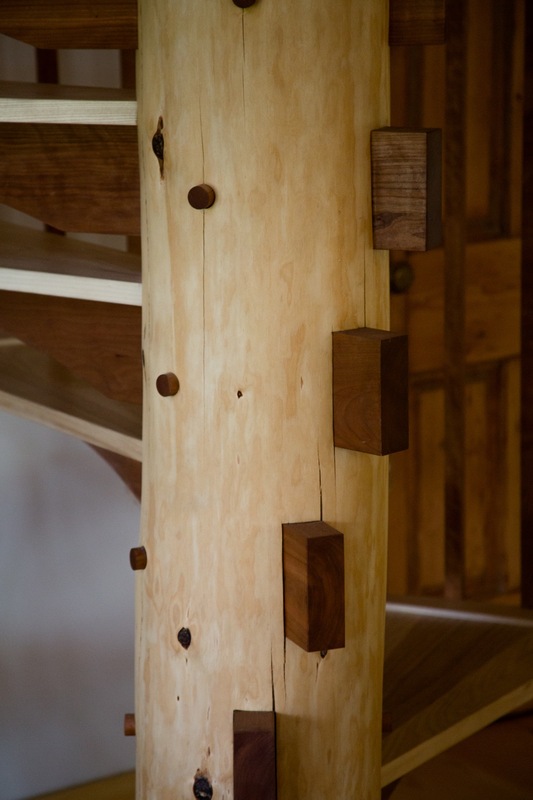 The clients, inspired by the Goosewing Timberworks shop, chose some similar details including a bank-barn layout, 26×42 footprint, and live-edge cherry accents. 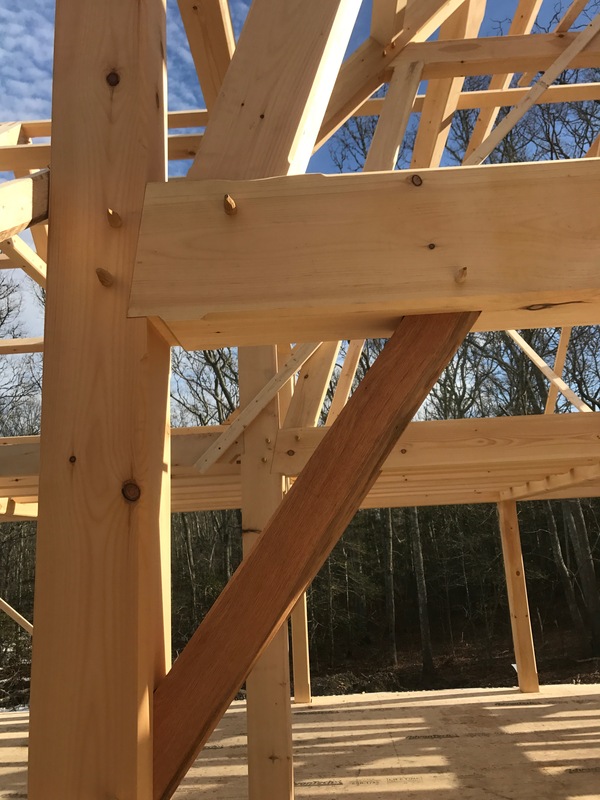 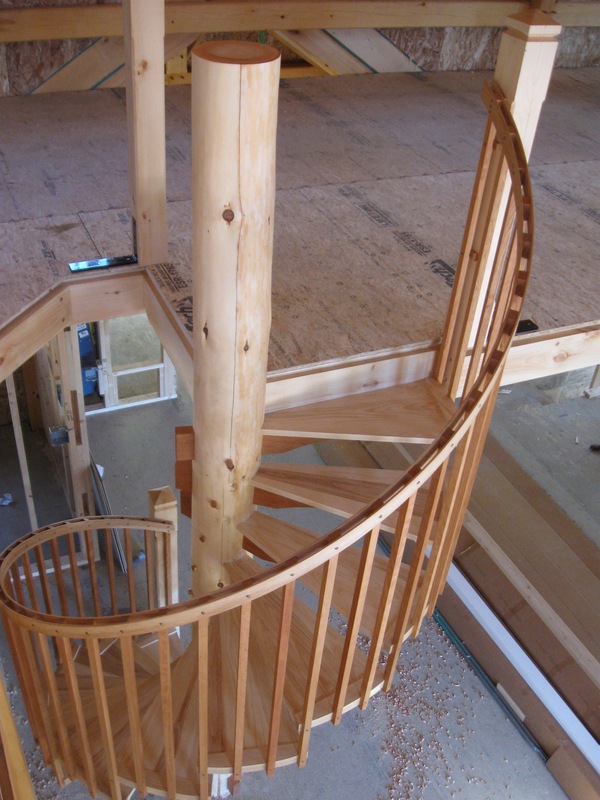 We logged and milled the cherry and spruce for the posts, girts, rafters, joists and braces right on site; the rest of the timber (in pine) came from a local sawmill. 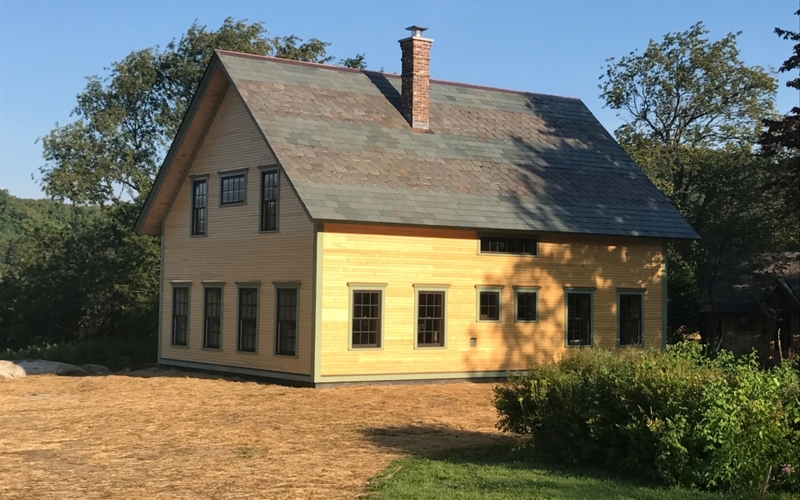 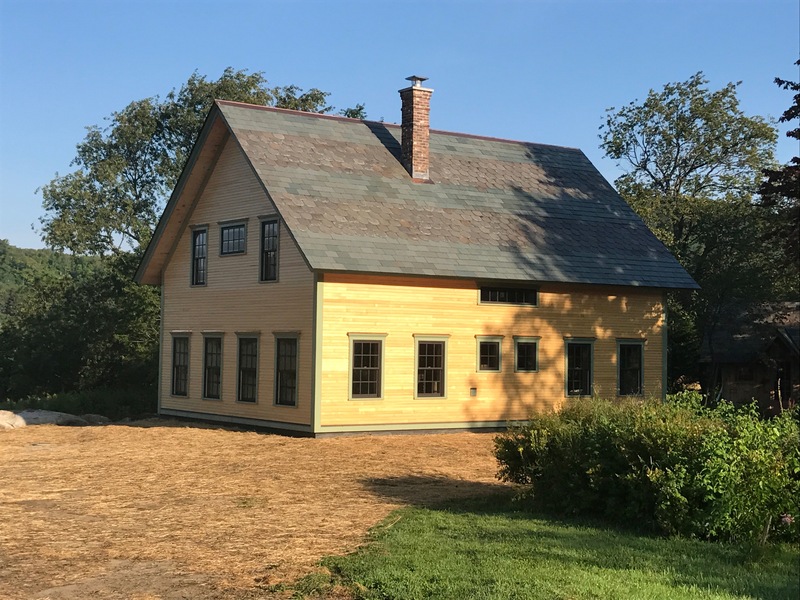 A local contractor finished out the barn with very fine details, including a custom-built oak door, maple floor, and slate roof.